A hand grenade is a small hand-held anti-personnel weapon designed to be thrown and then explode after a short time. Hand grenades may appear in several shapes, sizes and constructions. Some contain explosives, while others may be incendiary and filled with white phosphorus; or designed to emit smoke or gas. The most common grenade associated with terrorist attacks is the time-delay fragmentation anti-personnel hand grenade. These grenades, which played a major role in World War I, World War II, Vietnam and many other conflicts, are designed to be durable and simple to use. The conventional design uses a simple chemical delay mechanism, and contains high-explosive often cased by a thick metal exterior. Their primary function is to kill or maim by scattering lethal metal shrapnel fragments from the disintegrating thick metal casing when they explode. The firing mechanism of these grenades is triggered by a spring-loaded striker inside the grenade. Normally, the striker is held in place by the striker lever on top of the grenade, which is held in place by the safety pin. The user grips the grenade so the striker lever is pushed up against the body, pulls out the pin and then throws the grenade. The spark ignites a slow-burning material in the fuse. In about four seconds, the delay material burns all the way through. Time-delay grenades are very lethal and a problem can be their unpredictability: In some chemical fuses, the delay time may vary from two to six seconds. 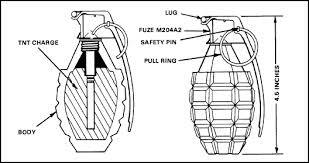 A grenade with its pin pulled can be a very simple booby-trap device for a terrorist to use. Unpacking the items surrounding a grenade packed in a bag will cause it to detonate. A grenade exploded at a checkpoint in Jordan’s Queen Alia International Airport in May 2003, killing a security officer. The incident occurred during a routine X-ray screening of a passenger’s luggage. An X-ray screener spotted the grenade and a searcher asked the passenger, a Japanese journalist, to open the suitcase. As the searcher picked up the grenade it exploded, killing him instantly and injuring three others. The journalist was taking the grenade home as a souvenir from Iraq, but though the grenade was deactivated. The fact that grenades often have a thick metal casing can make them relatively easy to identify under X-ray, providing the correct image enhancement features are utilised. Terrorists may attempt to conceal grenades behind other dense items, like a camera lens or lap-top computer for example. Terrorists may also attempt to conceal a grenade at the edge of a suitcase or adjacent to locks and hinges – in the hope that the dense metal suitcase frame or metallic features will make it less conspicuous. Because a grenade is a very dense object, its presence can often be revealed by using the “High Penetration” feature on the X-ray machine to remove other less dense clutter. Remember, a hand grenade may be more easily recognisable when viewed from the side in its familiar profile. But it will be harder for you to spot if it is viewed from the top. Not all grenades are thrown by hand. Several types are fired from rifles or purpose-designed grenade launchers. For example, tear gas grenades used in riot control are fired from riot guns; and the M203 is a grenade launcher that can be fitted to several types of rifles such as the M4 Carbine and M16 rifle.